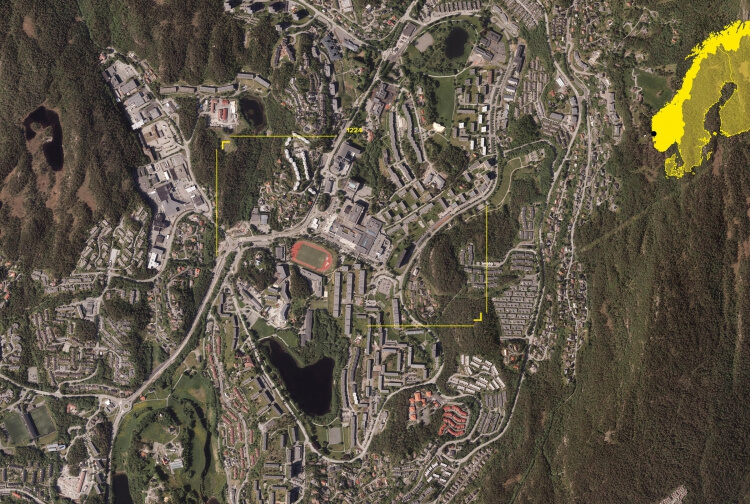 Growth expectations for Bergen acknowledge that the urbanization in Fyllingsdalen must be considered. Fyllingsdalen is a central district with significant green values but also has the potential for densification and transformation. We propose to strengthen the urban ecosystems and create attractive and active public spaces together with a public transport hub with large capacity ready for the future light rail infrastructure. We have chosen to introduce a blue skeleton for our whole plan in Fyllingsdalen. We open as many streams and rivers as possible linking them together into a green belt in a continuous blue-green structure. It connects the lakes, streams, Sæle lake and coniferous forest. In the young but very lush and diverse vegetation along Lauvås Ponds, Lynghaug Ponds, Ortuvatnet and along the creek east of Oasis we found rare and endangered habitats with a surprisingly rich bird fauna with fourteen red-listed species.